What mods have you done? What were the cheapest/most expensive? Links, pictures, advice, etc. wanted. Yeah, I know I'm needy. In a continual state of cruising. Re: Any other 2006/2007 owners? 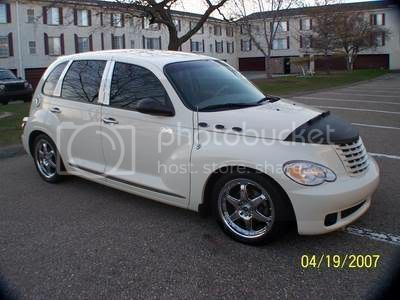 Check out my gallery on PTCruiserWorld.com. See what you like, ask questions. If you look up members > soonercruiser > you can view a list of my mods with specifics too. I have posted a guide for 2006 Powerwindows/Sunroof always on, I installed a Mac Mini in my 2006, Rear-camera, quite a few more coming. Search my posts for them. I added on the new Xenon front fascia, Love the way it looks. I also added on some 18" 5 spoke Metal FX wheels w/ paintable inserts(not painted yet, thinking about airbrushing them.) and I just ordered the 3 piece mid wing but it's not here yet so I cant tell you what I think about it yet other than what I have seen on the internet. Check my Gallery here, ask questions if you want. Exterior pics posted only. I'm a brand new member and PT owner, 2007 Touring Edition, non-turbo, in Silver with light gray interior, completely stock at the moment. Bought it used with 14K miles, factory demo. I've been looking for accessories, particularly grilles and interior mods but only seem to be able to find stuff for 2001 - 2005's. I have some under the hood mods planned, Air Raid filter charger, high energy coil, 8.5 mm plug wires, platinum plugs, cat-back exhaust. Thinking of two-tone paint scheme, silver lower and purple or cyan upper, bigger wheels/tires, etc. Any advice you can give would be much appreciated.